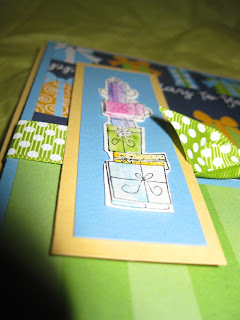 Birthday Cards And A Favor. Is a party favor a "thank you for coming to my party?" That's what I think it is. I wanted to make that point. The tag says, "thank you so much." The image is stamped on watercolor paper and colored with markers. Then I put a light layer of some glittery watercolor pigment over the top. I am quite certain there was not one kindergartner that noticed the shimmer (or the cupcake for that matter), but it was so nice to sit and craft for a few hours. The bags were run through the cuttlebug for an embossed look. They are filled with some candy. I believe in mostly clutter free gifts. Here is the basket with all 28 favor bags I made. This side view is supposed to show how I popped a couple of the gifts up for added dimension. There is also some of that shimmery watercolor paint. I think it is from Pearl-Ex, but I am not certain. I made two cards. The one with the green base was for my five year old. 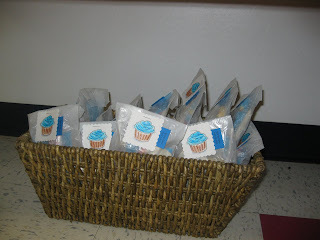 The other one is for a girl in his class that is having a party. The colors are the only difference. My boys have a greater appreciation for homemade gifts and cards than most children their ages. I know it's because they are being raised by a crafter and know how much time and love is put into each one. They also love making cards and crafts themselves. When he opened his card he made a comment about how cute he thought it was. What a sweetheart! My Baby Is 5 Today! ME: (bursting with excitement) Hey, your birthday is tomorrow. HIM: (much less enthusiastic than me) I know, does that mean I am going to lose a tooth tomorrow. ME: No, honey, probably not tomorrow. HIM: How about when I'm 20? ME: Oooh, I hope not. HIM: What about when I'm 80. ME: Yes, you will probably lose some when you are 80. HIM: How about when I'm 60 90? ME: You will probably lose some when you are 6. I was thinking he was going to be sooooo excited about being 5 and clearly losing teeth are much more exciting than having a birthday. This morning, however, he was excited and proud to be five. He thought he looked a little taller today. 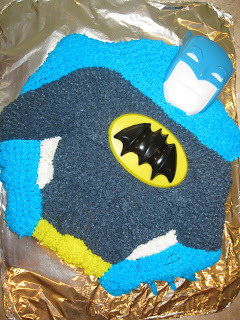 Here is the cake I made for him. He loved it (we had a party last weekend and he ate it then). 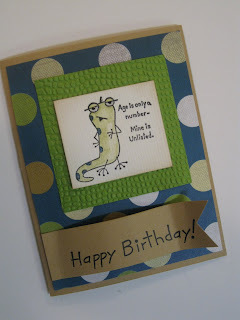 I will wait until tomorrow to share the card I made for him today to give to him today (the advantage of living at my house is that you might actually get a card on the day you are supposed to get it). It's not that he is an avid reader of my blog so I won't be ruining any surprises there. It's just that I need something creative to share tomorrow. So for the past couple months, several times a week I get an automated phone call that goes something like this, "this call is for Sally Spend-a-lot. If you are not Sally Spend-a-lot please hang up the phone. There is some personal information to follow for Sally Spend-a-lot. If you are Sally Spend-a-lot we are giving you three seconds to go into a different room for privacy. We are a debt collector. Again, you are acknowledging you are Sally Spend-a-lot by not hanging up." OK the first 26 times they called, I was very obedient and hung up because clearly my name is not Sally (I might have altered the name and gender slightly to protect the unknown). At this point, I am like OK this is an automated call and I can't really tell anyone to stop calling my house looking for someone that I don't know. So I decided to hear the message to see how I could help poor Sally Spend-a-lot and maybe a little for the sake of not getting this call any more. So I call the number and explained that I am not Sally Spend-a-lot, I don't know Sally Spend-a-lot, I've never heard of Sally Spend-a-lot, and this phone number has been mine for the past 9 years. Furthermore, I've never received any other calls for Sally Spend-a-lot. The person on the other end said, "Oh, you're a neighbor of Sally Spend-a-lot." I am not sure about that, I don't know Sally Spend-a-lot. "Well, Sally Spend-a-lot, lives next door." I explained the house next door is a rental and I am fairly certain Sally Spend-a-lot doesn't live there right now. After I got off the phone, I had to process the conversation. Really, for real? You are calling me, Sally Spend-a-lot's supposed neighbor? HMMMM....and am I supposed to go invite Sally Spend-a-lot over for some tea and dial the phone and hand it to her? Oh, Sally Spend-a-lot when you're done dealing with your debt collector I've made some fresh muffins to enjoy with me, your friendly neighbor. No hard feelings, we all have our problems. Don't worry, this can just be our little secret (along with the other 30 neighbors they have probably been calling). SERIOUSLY....why are they calling me? Were they hoping that Sally Spend-a-lot was just hangin' out and I could give her the phone and some privacy? Were they wanting me to go over and collect the debt? I know times are tough right now and people are trying to cut out the middle man, but that might be taking it a little too far! Wow, so if you've made it this far you are a trooper! So now, I must treat you with some eye candy. 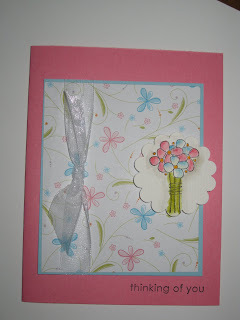 I love all the elements of this card: the layout, the roughed up edges, the gems, the punch, etc. I even love the colors, but I don't love how muted they turned out in this photo. I used white craft ink to stamp the image. 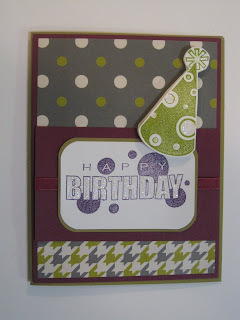 It is a Stampin' Up! image that my mom owns. Hey, why use your own stamps when you can use someone else's, right? Well, I have jabbered long enough. If you have questions about the card or possibly about living with lots of males (none about debt collectors) feel free to ask away. Just remember...you get what you pay for ;) Have a _______(you fill in the blank today) day! Heat oven to 350 degrees. Spray muffin tins with cooking spray or line with liners. In a medium bowl mix flour, baking powder, cinnamon and salt. In a large bowl mix egg, sugar, applesauce, apples and oil. Add the dry ingredients mixture and stir just until moistened. Mix in cranberries. Fill tins 2/3 full of batter. For the streusal topping mix all the ingredients and sprinkle over the batter. Bake for 20-25 minutes. Makes about 3 dozen. 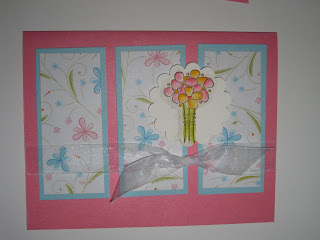 I am starting to feel a little anxiety because I haven't been crafting and I am running out of past cards to share. Maybe I should feel motivated instead and get craftin'! These are two more cards I made this summer. 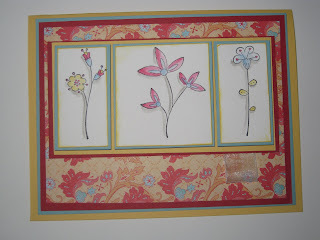 I actually made three using this stamp and paper but I gave the third one away before I photographed it. I know it's crazy, I actually gave one away. Of course, I didn't have to address an envelope and take it to the mailbox. I just had to hand it over. The stamp is from the dollar section at Michael's. 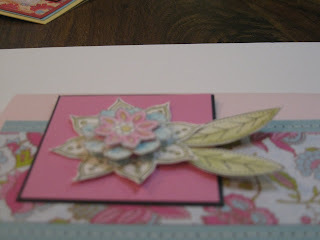 The paper is from my stash and it comes from one of those big stacks from JoAnn's. I just used markers and an aqua painter to color the image. They are stamped on watercolor paper with Stazon black ink. I used a little grey shadow to ground the image. Ah, group hug! Here they are posing together. Have an awesome Monday! 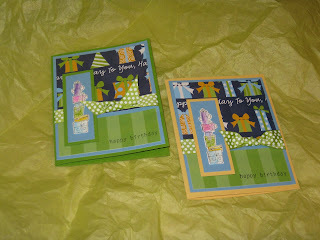 I am off to clean house since it is sooooo much more fun than crafting (hey, I am just trying to convince myself). 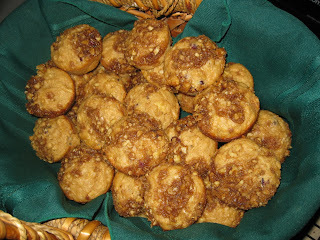 This morning I made five dozen apple streusal with cranberry muffins to bless some of the teachers at my boys' school. They are always surprised when they see me with my basket every two weeks, and they are always very thankful. I've included a photo of some of the muffins (the rest were baking) at the end of this post just for fun. I made these two cards this summer (still haven't got my creativity juices flowing). The pictures don't do them justice. The colors are amazing in real life, and there is lots of sparkly goodness! There are two hats stamped and cut out for lots of dimension. I wish I had taken a side view. Have a wonderful day and bless others with random acts of kindness! My kindergartner came home from school the other day. As usual I went through his backpack and recycled items that I had looked over. A few hours later he asked me where his sun picture was. Oh, honey, I think it's in the recycle bin. He dug through the bin and proceeded to pull out 5 or so of his papers. He gave me the stink eye and said, "Mommy, would you like it if you worked really hard on something and I threw it away." "No, honey, I wouldn't," I said. "Well, then don't throw mine away!" I promptly got a folder for him to put his schoolwork in from here on out. Bad Mommy! Side view. Sorry about the quality. It was late at night. I wanted you to be able to see the dimension, though. 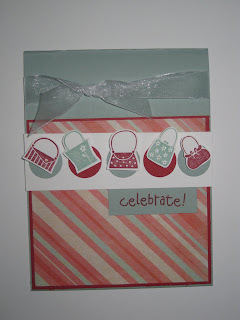 The stamp set is from Stampin' UP! My mom owns it and I don't have a catalog right now so I can't tell you the name. The paper is from one of the stacks that one of us have. 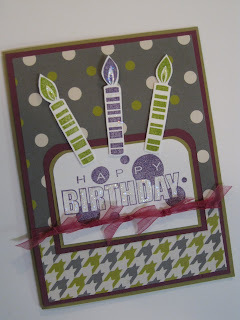 Although it's not Stampin' UP! it coordinates very well. We (my mom and I) added a little faux stitching because it needed just a little more something. We used watercolor crayons and an aqua painter to color the image. I made this card back in July. I haven't done any crafting since then and I am starting to have withdrawals. I hope to fit some crafting in this week. I guess that means I better bust a move and get the house in order today! If You Find It, I Want It Back! My sense of humor, that is. Today it is on hiatus! I am grouchy, but will spare you the details! Instead, I will try a posting a therapeutic photo. 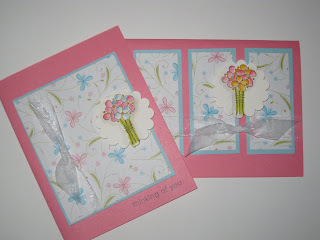 And with any luck I might find a few minutes to indulge in some crafting (not looking too good as today is a busy one). This card is actually kind of funny. In case you can't read the caption it says, "age is only a number.... mine is unlisted." This stamp was again from one of my mom's sets. There were several humorous stamps in it. I may have to pamper myself and get a set! This beauty was made with a dear friend of mine. 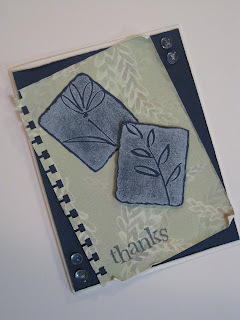 It is made with the Stampin' UP! set called Pick a Petal. I used an oval punch for the leaves and just bent them in half. I used white ink around the edges. There is a lot of dimension since every layer is popped up. Have a fabulous day and don't sweat the small stuff (if I keep saying that I might actually believe it by the end of the day)! 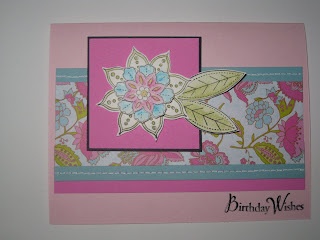 I love how this stamp set coordinates so well with the background paper. The stamp set is from Stampin' UP! but I don't know which one it is because my mom owns it and I gave my catalog to a friend. The background paper is from one of the stacks from JoAnn's. This is one my favorite cards. 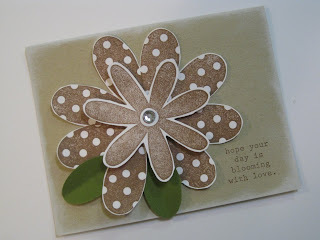 It is a based on a card that I made in class with my Stampin' Up! demonstrator http://www.dianagibbs.typepad.com/. 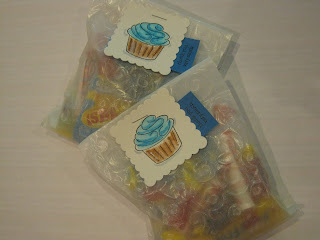 She has a fun blog that has awesome creations and a dose of great humor! There again, my mom's stamps so I don't know the name. 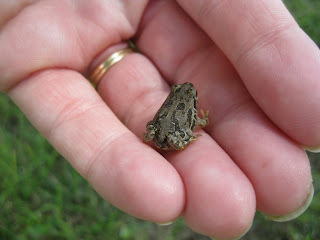 Look at my little friend. He was so tiny! There was an abundance of toads in Colorado this summer. Every step I took in a field sent dozens of them scattering to get away. I had fun playing with them. I thought I would be back by the end of July but I missed it by a few days. The boys started back to school without a glitch! It's a little strange having the house to myself for a few hours every week day while they are all at school. I was sad for about 5 minutes that my baby started Kindergarten. I got over it rather quickly. Don't send me hate mail for saying that out loud! I was actually quite sad at the end of the last school year and in anticipation of this event. I did a little crafting this summer, but it never seems to be enough! So, I hope you enjoyed the few cards I shared with you. I hope to be consistently posting again with my new found freedom!